Here is a new display or cake plate that I can't find on the gallery in particular I have not seen a gold edge trim as well before . Thanks Jonno, I will look at the plate shape and I'm sure the pattern has a name, but I need time to research both, so it won't be today. Please nudge me if it takes me too long to respond. re CL FRUIT DESIGN & GOLD EDGE ON APOLLO DP. Of course I will be patient, and I have seen another similar plate but didn't have my camera today. 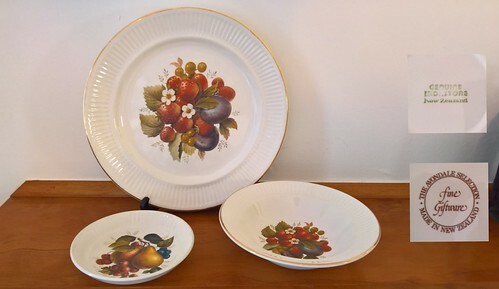 Should be able to get a photo on Tuesday and there are another two smaller dishes that I can't see on the gallery at the same shop. Will catch them as well. Looking forward to the Museum day next month. so I will add it to the Gallery thank you! Re: CL Fruit Design & Gold edge on Apollo DP. Will try and get some photos of the others tomorrow. now mini collection to take some pieces for comment on the day. One plate the same as the gold edge I posted but plain edge & no BS the other has a different fruit transfer design and no Gold edge or BS. 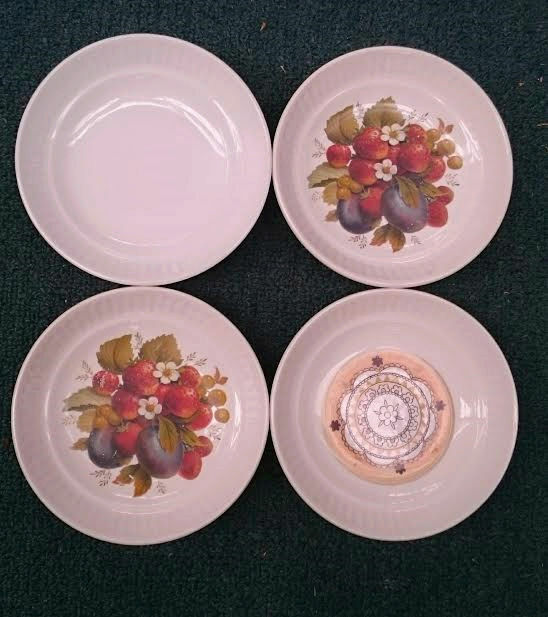 The two smaller plates had already sold before I got back. This one is strawberries , plums & grapes. Did you mean that these fruit based central designs used the same number? My pleasure to provide you with the "Round Tuit" for getting the job done. Question about this pattern name and number - does it still apply to desert bowls? 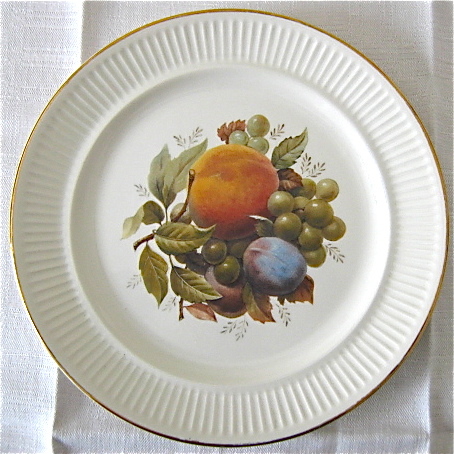 The reason I ask is the "Cake Plate/Server Peaches, Pears, Strawberries d997" seems an awfully specific name, and doesn't quite fit for a bowl. I think the patterns are the same, but I'm not sure if they will have the same name and number on those different shapes. I will have to spend some time checking it all out and I will let you know what I find Bruno. no rush at all for the information. I ended up with six of the bowls, all with the same strawberries transfer if that helps. 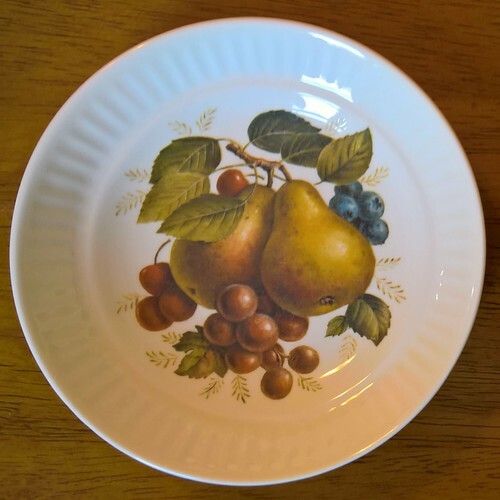 Yesterday I found the 4027 Apollo Fruit and now I realise that it is the same shape as our little fluted dishes that have lithos on them as yours does above. 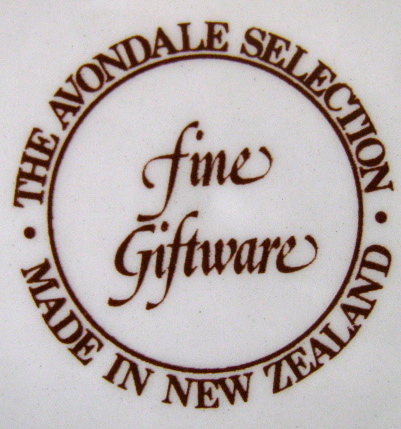 I found a photo of the Cake Plate and it had a server with it in a gift box on a page from the Crockery Shops about the Avondale Selection ware. The little dishes were there also in boxed sets ideal for gifts. There was no pattern name or number, but I will keep an alert out for them. The dessert bowl is bound to have it's own name and number, any idea what shape it is? 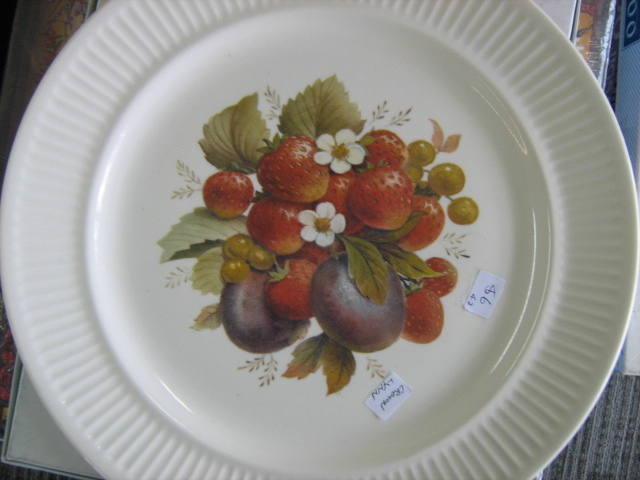 and also Fruit Series x 4 (no number) and could well be one and the same as there are 4 different Fruit patterns. I will think about it for a while as it could refer to the dessert bowls or the little 4027's couldn't it? the bowl shape would be the 4023 Fluted Oatmeal bowl (we had one of them at work when the gold-rimmed bowls arrived). 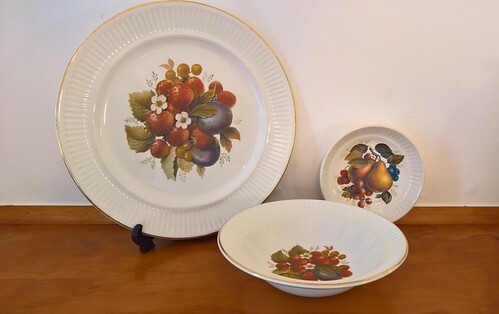 I have two of the 4017 bowls and they both have pears on them, but I did have a third with the peach transfer as well (didn't keep it as that terrible crazing all the way through) so it is probably that at least three variations exist (peach transfer, pear transfer, strawberry transfer) the same way the cake platters do. d985 also comes upon the gallery as Roberta d985? I will add the page with these dishes on it for a day or so and they show 4 using two different patterns. 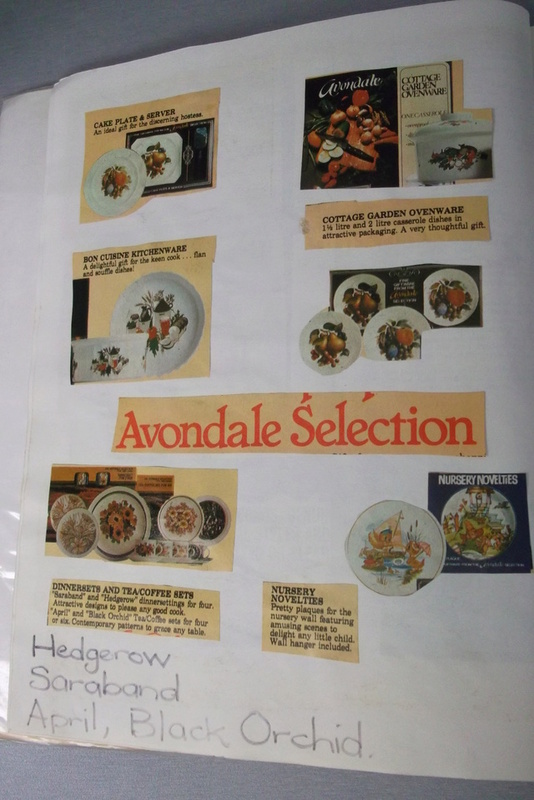 Fruit Set is a boxed set of 4 like in the Avondale Selection Pic's?..yep why not. I used as much Crown Lynn as I could yesterday and it looked great. just found this this listing on gumtree.com.au which has my six 4023 Fluted Oatmeal bowls featured, along with a larger 4026 Fluted Apollo Salad Bowl. 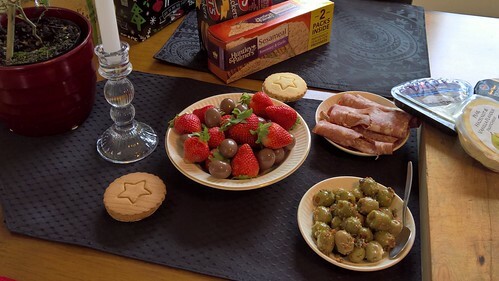 The all feature the Strawberries/Plums/Grapes transfer and the gold rim. 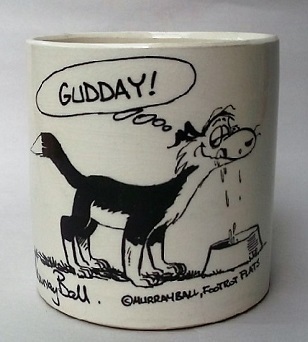 It has a later version of the Genuine Ironstone backstamp as well (in black - mine has the backstamp in green). I wonder if they were all sold as a single set together? I could imagine that as a real possibility with the matching gold rims. A Gift Set perhaps. . ..